These aren’t the sloppy joes Adam Sandler sang about in “Lunchlady Land,” but it is more fun if you sing it while cooking! 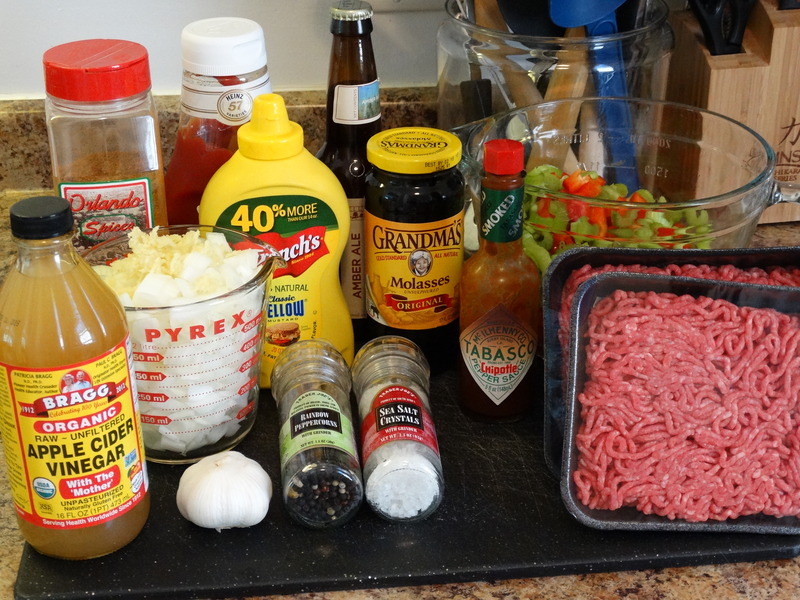 I recently made a batch of my favorite sloppy joes to help celebrate our friend Roberto’s birthday. Since I didn’t want to spend the whole evening in the kitchen while we were entertaining, this set-it-and-forget-it slow cooker meal was the perfect choice. It’s nice to be able to join the fun once in a while. I was going to save this recipe for football season, but I know that come fall I will have a ton of recipes to share with you all. 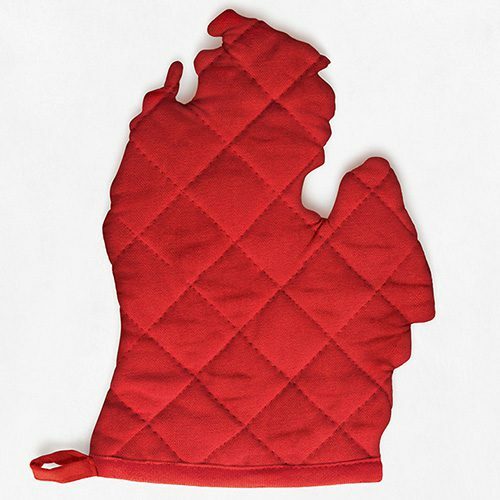 (Please…let me not think about football season for a couple more months!) Sloppy joes feels like a football meal to me, so it was a bit strange for me to make it in the spring. Kind of like making breakfast for dinner. Different, but still delicious! The prep work involved with this recipe is pretty minimal. 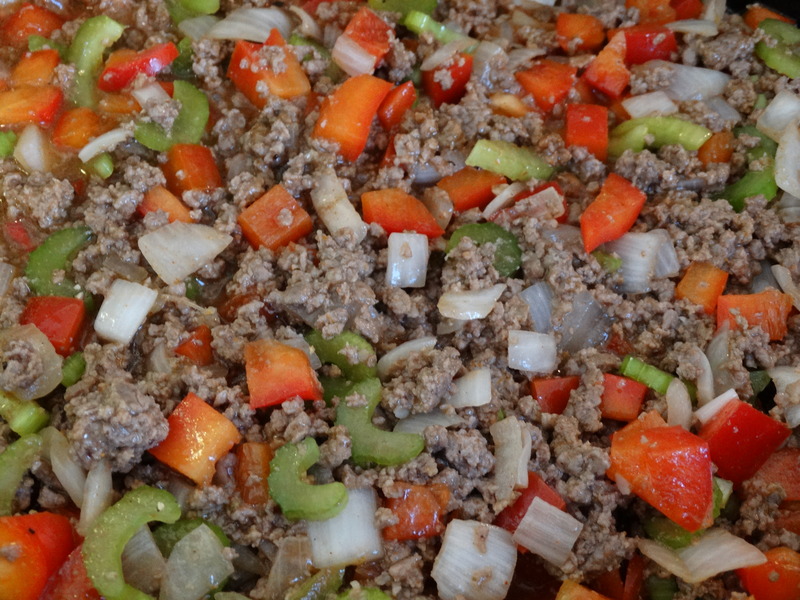 Chop an onion, red bell pepper, and some celery…mince some garlic…brown some ground sirloin. Your slow cooker does most of the hard work. So, let’s get started. Chop 2 cups onion, 2 1/2 cups red bell pepper, and 2 cups celery. Mince 4 cloves garlic. 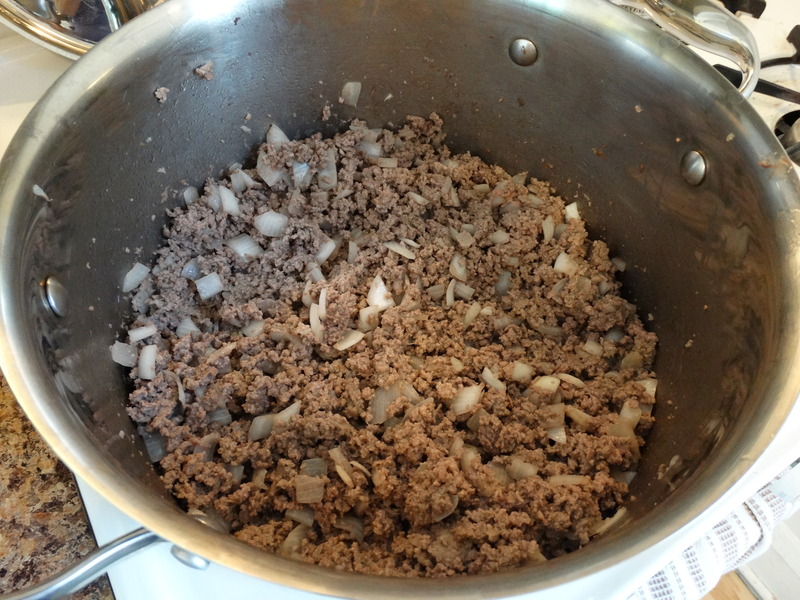 Cook 3 pounds ground sirloin with the onions and garlic. Use a wood spoon to break up the beef as it cooks. Once the beef is browned throughout, drain off any fat and transfer it to your slow cooker. 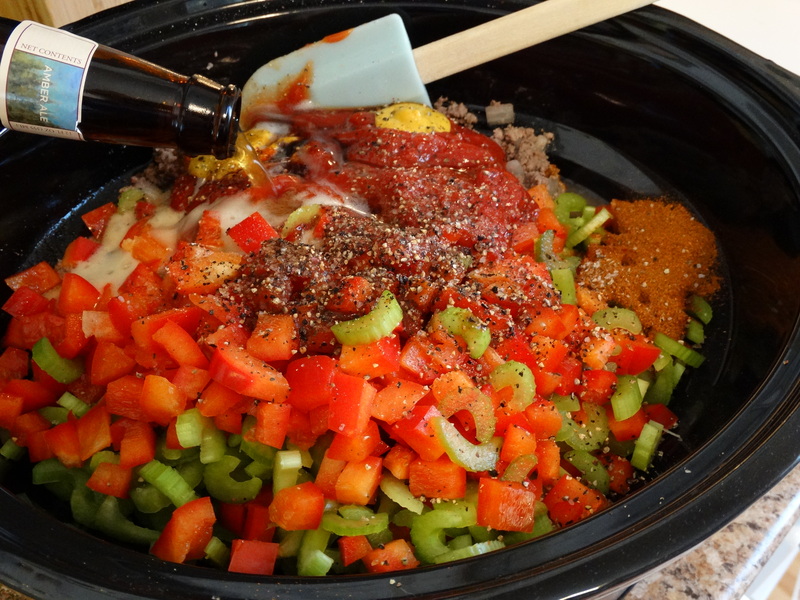 The remaining ingredients can go into the slow cooker as well: 2 1/2 cups red bell pepper, 2 cups celery, 1 cup ketchup, 2 tablespoons molasses, 2 tablespoons yellow mustard, 4 teaspoons chili powder, 2 teaspoons cider vinegar, 2 teaspoons sea salt, 1 teaspoon freshly ground pepper, one 12-ounce beer, and if you’d like, a bit of hot sauce such as Tabasco. I chose a beer from my home state of Michigan for this batch, Bell’s Amber Ale. Stir all of the ingredients together until well combined. Turn your slow cooker on low and cook for 6 – 8 hours. Now try not to drool as the delicious smells waft from your kitchen. Serve on a hamburger bun or roll of your choice. You can even add some sliced cheese if you’d like. I offered both sharp cheddar and pepper jack. I used a bit of both on my sandwich. As always, enjoy! 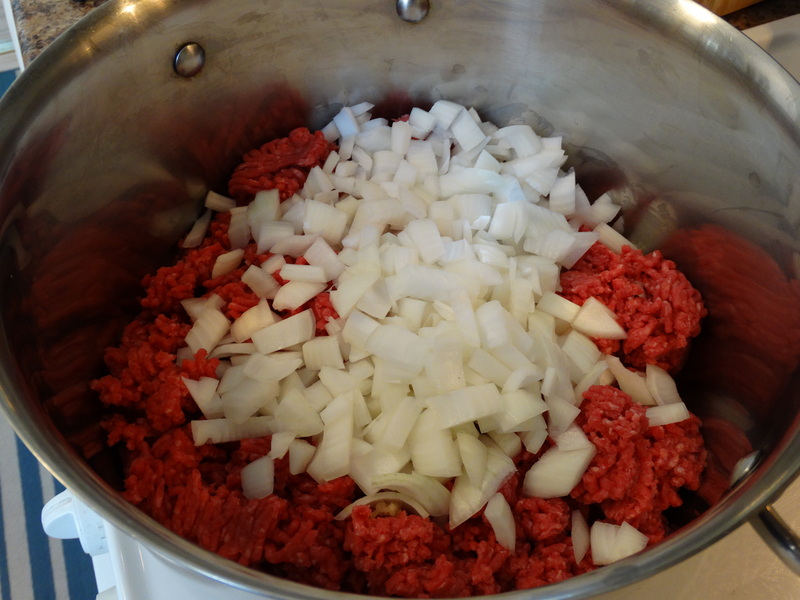 1) Brown 3 pounds ground sirloin with 2 cups chopped onion and 4 minced garlic cloves. Break up the meat as it cooks with a wooden spoon. 2) Drain off any fat before transferring the beef to your slow cooker. 3) Add the remaining ingredients to your slow cooker: 2 1/2 cups chopped red pepper, 2 cups chopped celery, 1 cup ketchup, 2 tablespoons molasses, 2 tablespoons yellow mustard, 4 teaspoons chili powder, 2 teaspoons cider vinegar, 2 teaspoons sea salt, 1 teaspoon freshly ground pepper, a dash of hot sauce, and 1 12-ounce bottle of beer. Stir to combine. 4) Cook on low for 6 – 8 hours. Serve on hamburger buns or rolls with sliced cheese (optional).